As the 75th Anniversary of the Bretton Woods Conference approaches in July 2019, the rules-based international economic system and its staunchest supporters face a significant challenge: how to ensure the global economic system evolves and endures to meet the challenges of the next generation? At this pivotal moment, the Committee is mobilizing our global community of thought leaders to make certain that the 1944 promise of peace and prosperity through international economic cooperation will be realized for the next generation. The Bretton Woods Committee – whose work and mission are to demonstrate the value of international economic cooperation and foster strong, effective Bretton Woods institutions as forces for global well-being – is uniquely and credibly positioned to honor the unprecedented period of economic progress that the last 75 years has brought us, while at the same time advance the global reform dialogue. To help global leaders envision how to evolve and strengthen the current rules-based economic system and its collection of multilateral development and financial institutions to address the challenges of tomorrow. To encourage and embolden policymakers to recommit to the “spirit” of Bretton Woods and the value of international economic cooperation as a fundamental force for global peace and prosperity. 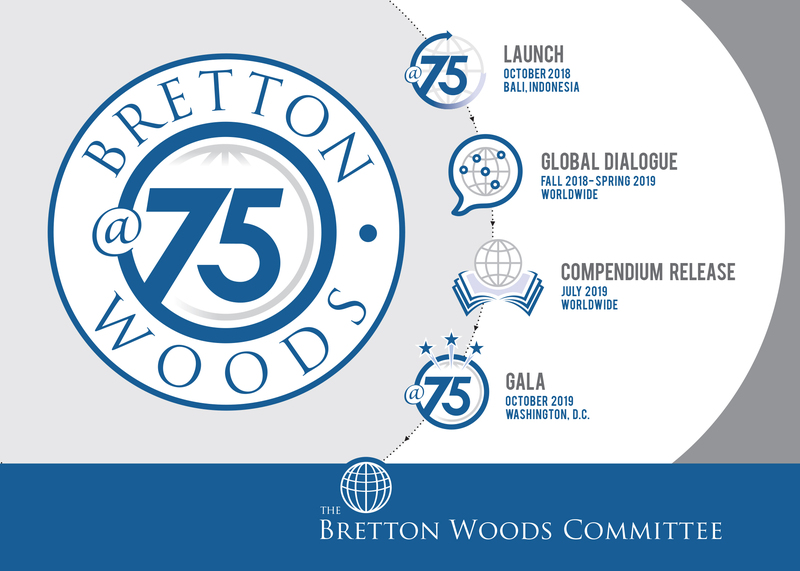 October 2018, Bali, Indonesia: The Committee officially launches Bretton Woods@75, presenting the key milestones ahead, and kick-starting the global dialogue at the International Council meeting. Fall 2018 – Spring 2019, Worldwide: The Committee hosts various opportunities for members and friends to contribute to the global dialogue in the form of surveys, focus groups, conferences, seminars, essay contributions, and other events. July 2019, Worldwide: The Committee releases the Bretton Woods@75 Compendium in July of 2019, on the official 75th anniversary of the Bretton Woods Conference. The Compendium is a unique collection of essays from the Committee’s network of global thought leaders providing recommendations for the future of international economic cooperation. October 2019, Washington, DC: The Committee hosts the Bretton Woods@75 Gala to celebrate the accomplishments of the Bretton Woods@75 dialogue, to honor 75 years of economic progress, and to ensure the Committee is positioned to continue to be effective in its mission for the next generation. If your company is interested in supporting Bretton Woods@75, please contact our Executive Director at secretariat@brettonwoods.org.